This splendid seafront house has been gradually upgraded over the last few years and last winter 2 beautiful new bathrooms have been completed. The master ensuite has been fully refitted with new rain head shower, vanity unit, loo and illuminated mirror to compliment the fabulous new floor to ceiling travertine tiles. The twin room ensuite has also seen a fabulous transformation, again floor and walls in travertine and a new rain head shower, cubicle, vanity unit, loo and illuminated mirror. Winter 2018 sees the entire top floor, hallways and rear study area redecorated in cool Egyptian Cotton with fresh brilliant white woodwork. Seafront, spacious and simply superb! Breakers is a fantastic Esplanade property with outstanding views of Combesgate Beach and beyond to Morte Point. This fantastic holiday home is part of the Crossways Court development, a two storey house with three bedrooms, sleeping 6 very comfortably. The same owner also had the beautiful two bedroom apartment above it, namely Point View. It has one of the largest seafront terraces of any holiday home in Woolacombe and the location is exceptional. The entrance to Breakers is reached by a flight of external steps up from the car parking area below. The front door opens into the spacious kitchen/diner with electric oven/hob, fridge/freezer, washer/dryer, dishwasher and microwave. The large country pine kitchen table with lovely old church settle can seat 6 plus easily for family breakfasts and dinner party fun! In the downstairs hallway between here and the lounge is a useful cloakroom/WC. In the sunny sea facing lounge, beautifully refurbished in cool coastal chic there are a three and two seater suite of Laura Ashley sofas and stylish contrasting armchair in smart seaside colours all positioned to sit and enjoy the views through the large front bay window along with the new wall mounted Sony fully smart TV and sound bar complete with Sky/Freesat/DVD. It has the obligatory Wi-Fi and the added benefit of a land line for incoming calls with outgoing for emergency services only. Upstairs there are 3 bedrooms, 2 with en-suite facilities and the other its own separate family bathroom. The master king size bedroom has an en-suite and wall mounted TV/DVD and sea views to the front. The twin room at the back has an en-suite and the 3rd bedroom has bunk beds, sea view and a balcony with front sea views. The communal area at the rear of the apartments has a clothes airer, BBQ area, picnic bench and private secure storage for surf boards and beach kit. This area can also be reached through a back door via the half landing. Crossways Court is just over the road to Combesgate Beach and around the corner to the famous shell beach Barricane with its delightful summer café (open Easter to September). Only another 10 minutes stroll and you are in the village of Woolacombe with its shops, bars and restaurants. There is an allocated parking space for 1 car and visitors spaces on a first come first served basis. A £100 security deposit is held and released after the holiday. Dogs welcome at £20 per dog per holiday. A stairgate is in place as dogs are not allowed upstairs. 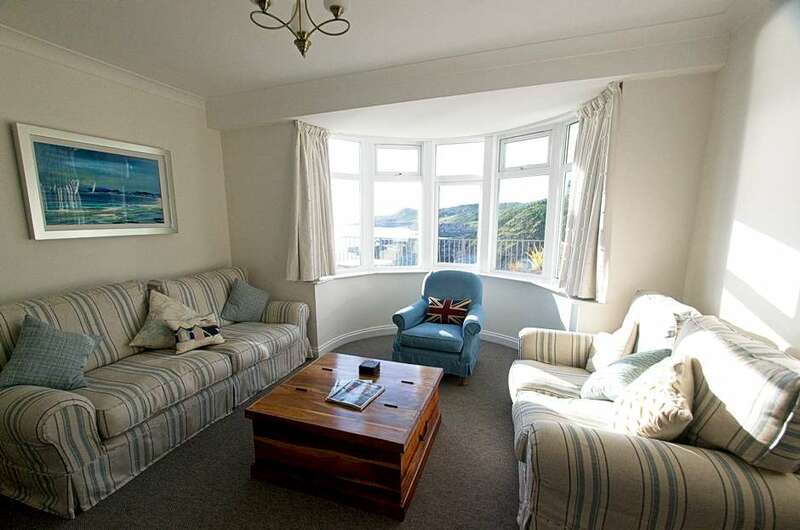 Breakers is well positioned and highly sought after due to its views, size, location and modern facilities, ticking all the boxes for your next holiday in Woolacombe.